Crystal Caste: 7 pc Fantasy Toxic-Blue/Pink - Now in three sizes! 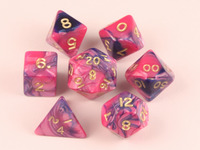 7 pc Fantasy Toxic-Blue/Pink - Now in three sizes! Toxic colors are a bright two-color neon design and come in a 7 piece poly set as shown. Crystal Caste now offers these great colors in a mini 12mm set, a standard sized 16mm set and a GIANT 35mm set.